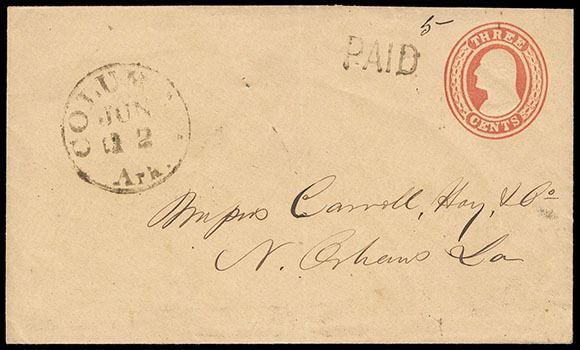 Confederacy, (Arkansas) Columbus Ark., Jun 12, clear strike of cds with matching "PAID" handstamp and manuscript "5" rating on U.S. 3¢ red (U10) Nesbitt buff entire from the Carroll Hoy & Co. correspondence to New Orleans La., Very Fine and rare Confederate Arkansas use. 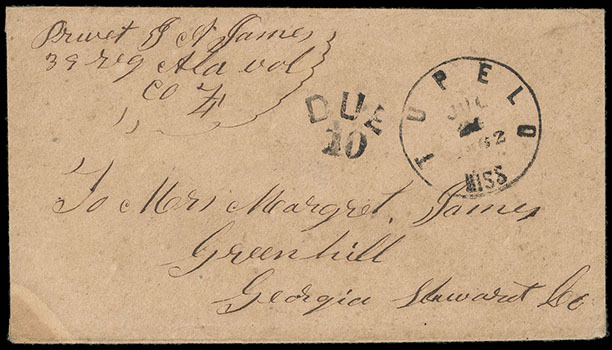 Confederacy, (Georgia) Postal History, group of 7 covers comprising Griffin Ga. "Paid 5" stampless to Columbus Ga.; Columbus Ga. cds with "Paid 10" in circle rating h.s. to Albany; Troup Factory blue cds and "Paid 10" handstamp to Carrollesville Miss., #1 four margins used from Savannah Ga. to Milledgeville Ga., #1 two singles from "Tebeauville, March 14" to Richmond Va; #6 pair from Covington to Richmond Va.; #11 four margins used from Thomaston Ga. to Athens Ga.; mixed condition, F.-V.F. 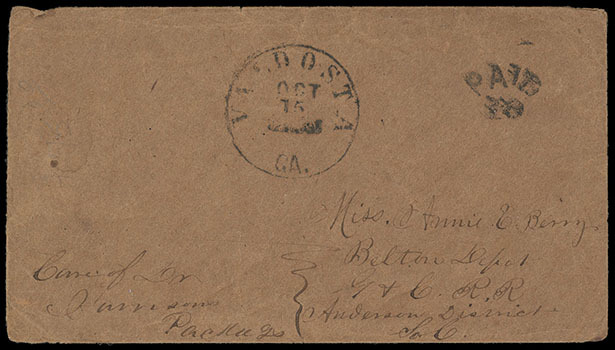 Confederacy, (Georgia) Valdosta, Ga., Oct 15 (1864), cds and matching "Paid 10" in arc on brown homemade cover to South Carolina, contents from a wounded soldier in the Army of Tennessee recuperating in hospital, Very Fine. 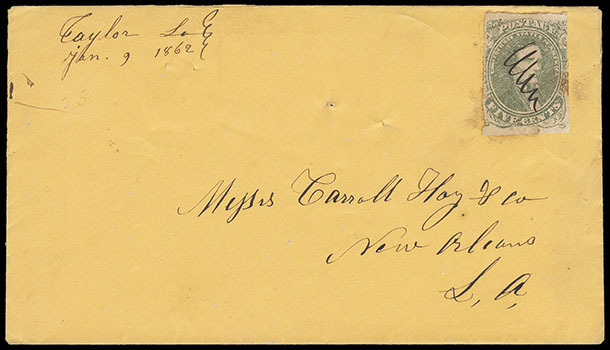 Confederacy, (Louisiana) "Taylor La., Jan. 9 1862", manuscript postmark and matching squiggle cancels 5¢ green (1), margins to in, on orange Carroll Hoy & Co. correspondence cover to New Orleans La., F.-V.F. and rare town. Confederacy, (Louisiana) Stamped Mail, group of 11 covers comprising #1 from Alexandria, #2 from Jackson, #12 from Jackson with ms. postmark, #7 pair with ms. "Kingston La, July 30/64" postmark, #2 from Mansfield, #1 from New River, #4 pair from Port Hudson, #1 two singles from St. Francisville (addressee excised), #12 from Homer, #1 and #12 on New Orleans to Liberty Miss. turned cover, and #1 used from New Orleans; mixed condition, F.-V.F. 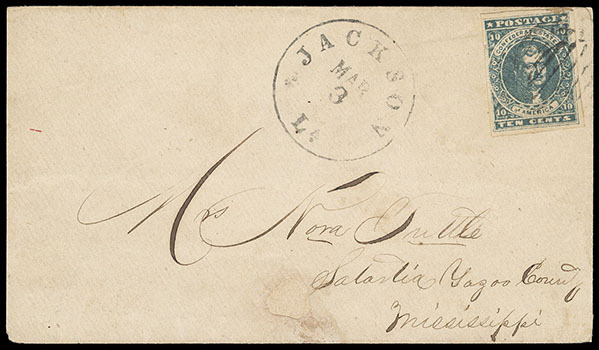 Confederacy, (Mississippi) Stampless Mail, group of 10 comprising 1863 manuscript. "Forrest, Miss. 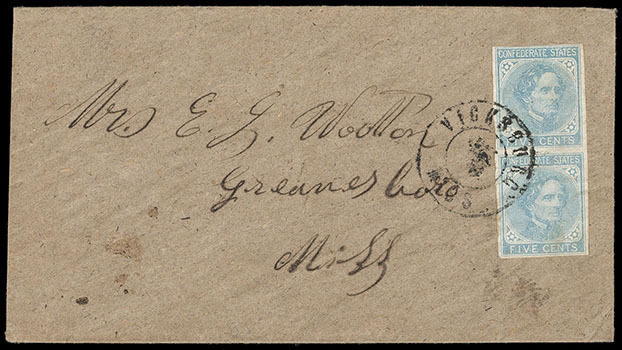 July 31" postmark and "Due 10", 1862 "Edwards Depot, Miss" and "Paid 10", 1861 Corinth Miss. and large oval "Paid 5", 1861 Carrollton Miss. and "Paid" "5", Canton cds and circled "10" rating, 1861 Canton cds and woodcut "PAID 5" rating handstamp; Three Station Miss. cds and manuscript. "Paid 10c" rating, 1862 Tupelo cds and "Due 10" rating, 1861 Vicksburg cds and "Paid 5" rating, and 1861 Yazoo City cds and "Paid" handstamp; mixed condition, F.-V.F. 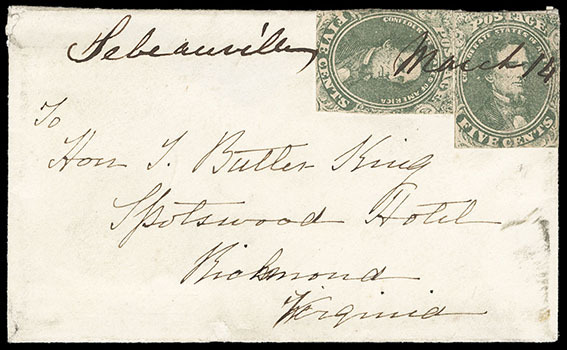 Confederacy, (Mississippi) Stamped Mail, group of 22 covers and a front, including #6 pair and #2e covers from Vicksburg, four covers from Canton with circular grid cancels, #12 from Okolona, #11 from Newton, #6 pair from Morton, #7 pair from Monticello, #4 from Baldwin, #11 from Aberdeen, #7 with ms. "Bankston, Miss." postmark, #12 from Brookhaven, #4 milky blue pair from DeKalb, #11 with ms. "Enterprise Miss" postmark, #11 from Fayette, two #11 covers with ms. "Kirkwood Miss." postmark, etc. ; mixed condition, F.-V.F. 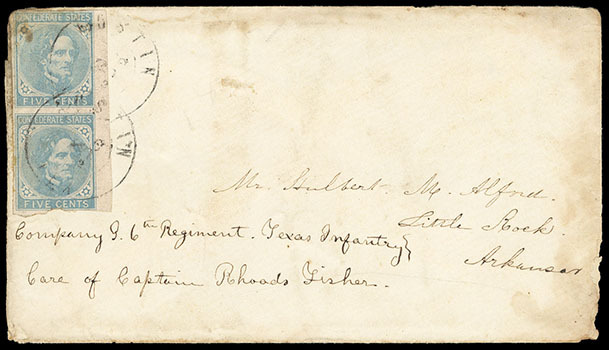 Confederacy, (Texas) Austin, Tex., Aug 20, 1862, two strikes of double-circle datestamp tie 5¢ light blue (6) vertical pair with right sheet margin, on cover to Little Rock, Arkansas, endorsed "Company G, 6th Regiment. Texas Infantry, Care of Captain Rhoads fisher", F.-V.F. The 6th Texas Infantry wen with other Texas units to Arkansas in the Summer of 1862. In January 1863, the 6th Texas was captured at Fort Hindman. 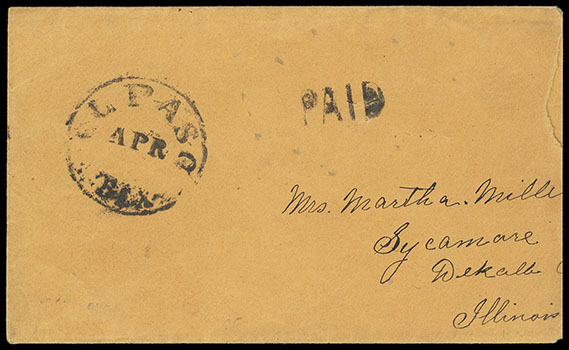 Confederacy, (Texas) El Paso, Tex, Apr, cds and matching "PAID" handstamp on orange cover to Sycamore Ill.; reduced at right, Fine and rare, ex-Guggenheim, "Camina". ONE OF ONLY TWO RECORDED CSA EL PASO STAMPLESS "PAID" USAGES. 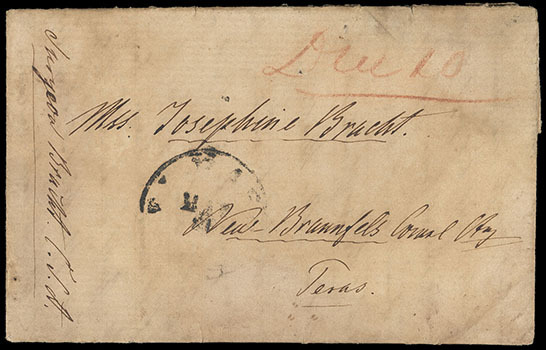 Confederacy, (Texas) "Franklin El Paso County Texas", dateline on circa 1862 folded letter with partial "El Paso, Mar 21" cds with red crayon "Due 10" rating to New Braunfels Tex., endorsed "Surgeon Bracht C.S.A. ", letter from German-Texan Dr. Felix Bracht as surgeon with General Henry Sibley's 1862 campaign; light toning and soiling, Fine.